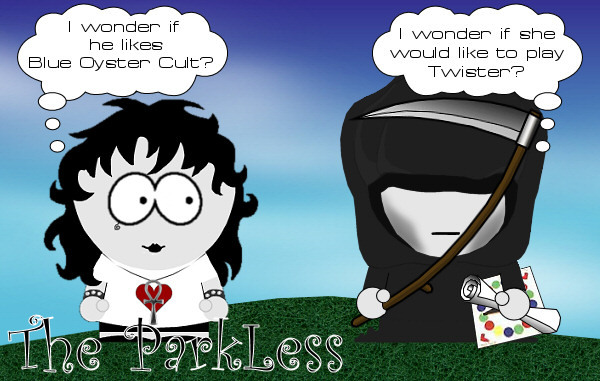 The ParkLess #1: Perfect Match? The first in another irregular series based on my South Parkesque versions of the Endless characters. I have submitted a couple of pics before. If you don’t get the jokes in the thought bubbles, you haven’t watched Bill’n’Ted’s Bogus Journey enough…. I loved this pic immediately I saw it in the DCG gallery and couldn’t stop myself having a go at giving it a simple coloring. This is a gift for Strangefish (who was kind enough to let me do a colored version) and also for Lady D (whom the original was gifted too) 😛 First thing I did after downloading the pic was promote it to a new layer set to multiply. I then added a new layer below this for the coloring. Using the lassoo tool to select the outline various areas to be colored, I built up the color starting with darkest shade first, moving inward with lighter and lighter shades. Before deselecting each area, I applied a small gaussian blur to soften the color changes. 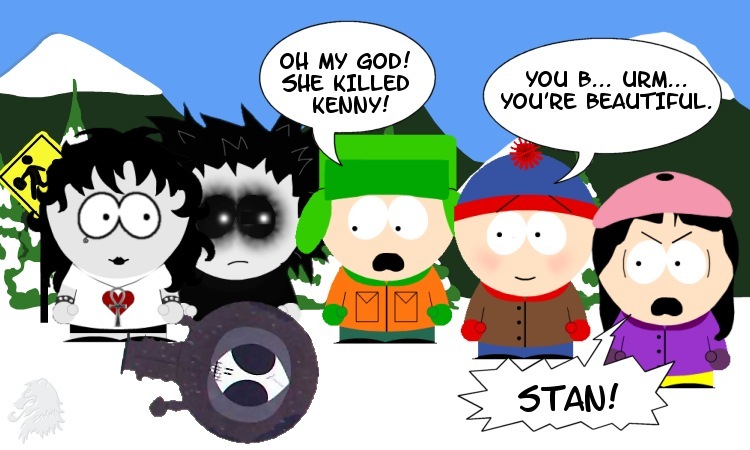 Ryanarya posted the link at the bottom in the no topic thread to a page where you can create your own characters in the South Park style. 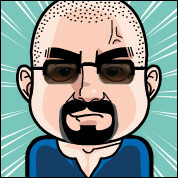 We had a big influx of pics of our very own artists done in this style. And I got a wee bit of inspiration. Thanks Ryanarya. Here we have The Endless (L-R Destruction, Delirium, Despair, Dream, Death, Desire, Destiny) This was a lot of fun to do. I used the page applet to get the basics done, then tweaked and added stuff in PSP. Brought them altogether on a nice hill under the stars. Hope you all like them. Well, here is Rachel Leigh Cook as Death. The base pic was such a godsend, all i had to do to her was replace her red shorts. the whole layer was then desaturated to give her a deathly flesh tone. the lips were darkened using a red layer. the eye makeup was done using a vector layer set on multiply. i the ankh was drawn using the vector tool, then metalized using a filter. additional reflections of arms and pumpkin added manually. the pumpkin was one i found on the net, with the eyes and mouth added by hand and dodged to give a glowing effect. i added the shadow on her arm, and a faint orange glow on her arms from the pumpkin. the background was part of a larger pic i had, enlarged and smoothed to give a suitable moody feel. the text is Spirits of the Dead by Edgar Allan Poe.